Today we have a guest post by Dr. Andrew Biro, Head of the Department of Politics, Acadia University, Nova Scotia, Canada. He can be reached at andrew [dot] biro [at] acadiau [dot] ca. Chad Raymond recently wrote a couple of posts (here, here, and here) about having students create board games based on course content. I did something similar in my Politics of Water class last fall, as a capstone exercise in the last couple of weeks of the course. It was a fun way to end the course, and by inviting high school students to play the games, it gave my students the sense that they really could use games to engage in a teaching exercise. Students worked in groups of 4-6 to design a board game that incorporated some “lesson” from the course. The course is rather eclectic. Topics include geopolitical conflicts over water, municipal water privatization, engineering mega-projects (big dams), and gendered access to water in the household. This gave students lots of choices, and they produced eight fairly diverse games. To prepare them to design games, the class played the California Water Crisis game and then discussed what the game taught about the politics of water in California. Then, as we got closer to the game design phase of the course, I brought in my English department colleague, Jon Saklofske, who works on games as research and teaching tools, as a guest lecturer. The students had one week, which included two 80-minute classes, to work on their games. 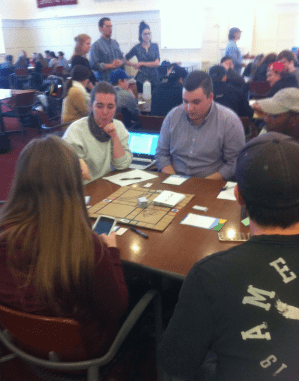 The following week, students spent one class presenting their games. This was a workshop session — each group explained the mechanics of its game, what lesson(s) it was supposed to teach, and how. Feedback from the rest of the class gave groups a final chance to fine tune their games. To encourage good feedback, each group was evaluated on both its presentation, including its response to feedback, and the feedback provided on other groups’ presentations. The next class session was devoted to playing the games. A group of grade 11 and 12 social studies students at a local high school also came in for that class session. Class time was divided in half, so that each of my students got to run their own game once and play one other group’s game. The high school students got to play two different games. Players evaluated the game(s) that they played using a form I had created. They weren’t asked to grade the games per se but to provide feedback: Was it easy to understand? Fun to play? What lessons did it teach and how well did it teach them? I used these evaluations to inform students’ marks, and they were available to students for use in preparing the final component of the project: a game manual that included instructions for playing the game and a brief essay explaining the pedagogy behind the game for teachers who wanted to use the game in their own classes. There were some logistical issues that cropped up, but overall it went quite well. I was impressed by the variety and thoughtfulness of the game designs. A debrief in the next (final) class confirmed that the students had fun — one of the complaints from my students was that they weren’t able to play more than one game. And they had a chance to think about not just the content of what they wanted to communicate, but also how to package that content so that it could find an audience.